Push a button and turn on the television; tap a button and get a ride; click a button and "like" something. The touch of a finger can set an appliance, a car, or a system in motion, even if the user doesn't understand the underlying mechanisms or algorithms. How did buttons become so ubiquitous? Why do people love them, loathe them, and fear them? 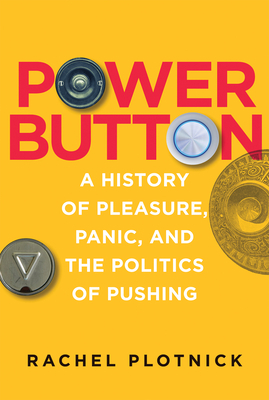 In Power Button, Rachel Plotnick traces the origins of today's push-button society by examining how buttons have been made, distributed, used, rejected, and refashioned throughout history. Focusing on the period between 1880 and 1925, when "technologies of the hand" proliferated (including typewriters, telegraphs, and fingerprinting), Plotnick describes the ways that button pushing became a means for digital command, which promised effortless, discreet, and fool-proof control. Emphasizing the doubly digital nature of button pushing--as an act of the finger and a binary activity (on/off, up/down)--Plotnick suggests that the tenets of precomputational digital command anticipate contemporary ideas of computer users. Plotnick discusses the uses of early push buttons to call servants, and the growing tensions between those who work with their hands and those who command with their fingers; automation as "automagic," enabling command at a distance; instant gratification, and the victory of light over darkness; and early twentieth-century imaginings of a future push-button culture. Push buttons, Plotnick tells us, have demonstrated remarkable staying power, despite efforts to cast button pushers as lazy, privileged, and even dangerous.